Hummingbirds choose flowers based on colour. Red is the most attractive to hummingbirds, but they are also drawn to deep blues, bold pinks, and red-oranges. The best types of flowers to attract hummingbirds are wall climber and tubular flowers on tall stems. Flowers should ideally be wild native species with a long blooming period. Hummingbirds have no sense of smell so they rely on visual cues to find food sources. You can maximize the visibility of your garden or deck using red ribbons, streamers, or other red objects on display to capture the attention of hummingbirds. Hummingbird feeders can be purchased from most gardenstores or centers. The best onesare the hummingbird’s favorite color – bright red. Feeders should be filled with natural rather than instant nectar, which often contains food colouring and other unhealthy ingredients. Hang the feeder in a highly visible place where it will be easy for hummingbirds to reach, preferably in an open area where the hummingbirds can spot approaching predators, or ideally, out of reach of predators. Clean the feeder and replace the nectar at least once a week, and preferably every 3 days to prevent bacteria buildup. Add 1/4 cup of organic cane sugar to 1 cup of boiling water, stirring until the sugar dissolves. Remove the mixture from the stove and let it cool completely before adding it to the hummingbird feeder. You can make larger batches, as long as the mixture is always 4 parts water to 1 part sugar. Excess homemade nectar can be kept in the fridge for 3-4 weeks. Never use honey or artificial sweeteners in a hummingbird feeder. Honey can cause hummingbirds to develop a tongue fungus, and artificial sweeteners have no nutritional value. 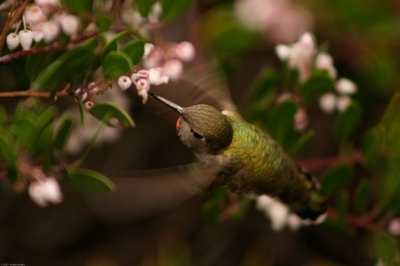 Chemical pesticides can poison hummingbirds. See Natural Garden Pest Control for safe, non-toxic options such as homemade natural pest spray recipes, pest repellant plants, and more. Hamir, A. (2008). “Luring Ladybugs Into Your Garden – Garden Pest Tip.” GardenGuides.com. Hilton Pond Center for Piedmont Natural History & Operation Ruby Throat: The Hummingbird Project. (n.d.). “Top 10 Native Hummingbird Plants.” Rubythroat.org.